Maybe Muhammad Ali wanted to be on that golf cart Wednesday night. Maybe he wanted to hear a crowd's cheers one more time. Maybe he actually feels a real strong connection to Miami, where he beat Sonny Liston in 1964 and where the Marlins opened their brand-new stadium Wednesday. If that's the case, if "the Greatest of All Time" was eager and anxious to be part of Opening Day ceremonies at Marlins Park, officials should have come up with something else. Perhaps a brief shot of him on the video screen, waving from the owner's suite. Because putting him on a golf cart for an excruciatingly slow ride from the bullpen to the pitcher's mound was a total buzzkill. The scene didn't fit the rest of the evening, which was joyous, festive and celebratory. Instead, Ali's appearance was sad, awkward and eerie. When the crowd stopped trying to muster up cheers and a half-hearted "Ali, Ali!" chant, it watched in stunned silence. The 70-year-old former champion, his frail body ravaged by Parkinson's disease, trembled uncontrollably as Marlins owner Jeffrey Loria wrapped an arm around him. 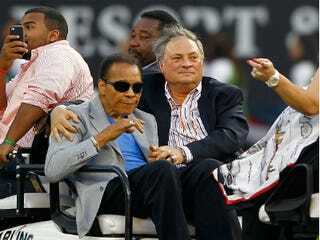 Loria, who isn't very popular among fans, likely would have been booed if Ali weren't next to him. That's one reason the move to include Ali seemed so exploitative — Loria using him as a shield and as an unnecessary, high-profile prop. "I wanted to give the fans a sense that we're doing special things for them," Loria told reporters after Miami's 4-1 loss to the St. Louis Cardinals. Loria said that he convinced Ali to participate about two months ago. "I thought it would be nostalgic, and his wife [Lonnie] thought it might be fun for him to come here," Loria said. If it was fun for the champ, we couldn't tell. He wore dark glasses and a blank expression, with no visible connection to the happenings around him. Incapable of throwing the first pitch, Ali was handed a ball and handed it to a player when the ride ended. The moment was nothing like the image of Ali lighting the 1996 Olympic Torch in Atlanta, when the trembling didn't overshadow his dignity, strength and conquering spirit. As the Huffington Post noted, "The crowd both in stadium and on Twitter reacted with an apparent mix of depressed sympathy, mass confusion, and, at least online, open suspicion over Loria's motives." Is it selfish not to want to see Ali like that? Absolutely. We have our memories and don't want them ruffled by disturbing images from the present. Surely Ali's loved ones understand, keeping his public appearances to a bare minimum. Surely they don't want Ali to be a downer to his fans. Ali's connection to Miami is so faint — a fight that occurred 48 years ago — that he seemed out of place at Marlins Park. Especially since there are no known ties to baseball itself. Again, having him wave at fans from a suite would have been one thing, sparing everyone the prolonged image of his shaky ride. But putting him on full display for several minutes in the middle of the field seemed like a cheap publicity stunt gone horribly wrong. "The opening of Marlins Park started off with a parade of showgirls and Jose Feliciano singing the National Anthem," wrote Deadspin's Erik Malinowski. "It ended with the sad, shameless sight of Loria trotting out Ali's disease-ravaged body for a forced on-field ceremony. Happy Opening Day, everyone." Loria was as clueless afterward as he was when the idea struck him. "The disease is debilitating, but he is still the most famous person on the face of the earth," the owner said. "It's a big up for the crowd and for me. That's what it's all about." No, it was about using an all-time legend for selfish purposes. It was a disgrace. Ali deserved better, and so did everyone who watched.